When you register as an affiliate, you'll be provided with unique URLs. When someone clicks banners or links from your site, from your newsletter, eZine or promotional campaign, we put a cookie in their browser. If a purchase is made within 30 days of clicking that link, you get 30% of that sale. MediaMonkey is an easy-to-use music manager and media jukebox for serious music collectors and iPod users. It catalogs your CDs, OGG, WMA, MPC, FLAC, APE, WAV and MP3 audio files. It looks up missing Album Art and track information via Freedb and the web, and includes an intelligent tag editor and an automated file and directory renamer to organize your music library. It includes a CD ripper, CD/DVD Burner, and audio converter for saving music, and manual or automated playlist editors for creating music mixes. Its player automatically adjusts volume levels so that you don't have continually fiddle with the volume control and supports hundreds of Winamp plug-ins and visualizations along with a Party Mode for use in public places; or if you prefer, it can use Winamp as the default player. It also includes portable audio device synchronization that allows you to quickly synch tracks and playlists with iPods and other portable audio devices. An easy-to-use music manager/jukebox for serious music collectors and iPod users. It catalogs CDs, OGG, WMA, APE, FLAC, WAV and MP3 files and rips CDs, converts audio, and tags & renames files. It creates music mixes, levels volume and it's free! 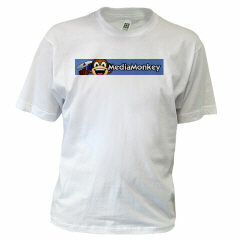 If you're a proud MediaMonkey user, don't be shy about it! Get your t-shirts, mugs, and mouspads here.